“The most fundamental reason one paints is to see” - Brett Whiteley. 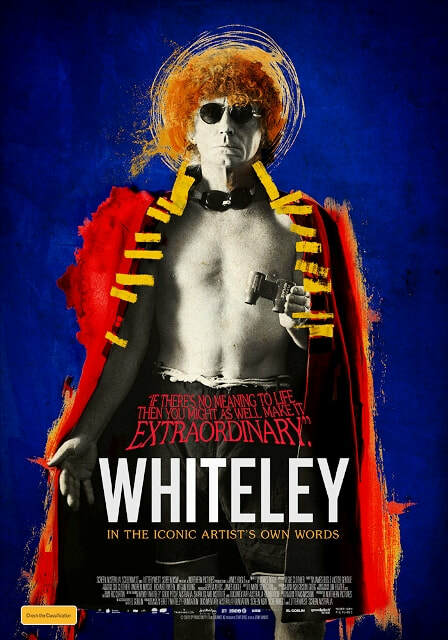 James Bogle’s documentary Whiteley portrays the life of Australia’s most famous, and most tragic, modern artist Brett Whiteley, whose legacy is kept alive by his muse and ex-wife Wendy. Lovers since they were teens, the pair was undoubtedly the most avant-garde of Aussie expats during the 1960s and ‘70s after Whiteley was awarded, first, an Italian Government Travelling Art Scholarship in 1959, and then the Biennale de Paris’s International Prize for Young Artists in 1962, which took them to Florence, Paris and London. This prestigious recognition set the young painter on a path to a future that many artists could only dream about. In 1967 Whiteley won a Harkness Fellowship scholarship to study in New York, where he and Wendy set up home in the penthouse of the Chelsea Hotel at a time when the lives of artists and musicians were almost synonymous - think Dylan, Joplin and Hendrix. It was also the period of the Vietnam War and Whiteley was a great advocate for peace. One of his most dynamic works from that time is The American Dream, which sprawls over eighteen panels, flowing from a serene beginning to an end depicting utter chaos - the inevitable result of war. It was also during this period that Whiteley’s use of alcohol, marijuana and other drugs increased, although he claimed that these things inspired him, thus assisting him in his art. On their return to Sydney, the couple settled in Lavender Bay and Whiteley worked prodigiously and successfully, in 1978 becoming the only artist to ever win the Wynne, Sulman and Archibald Prizes in the same year. Ultimately though, he became addicted to heroin and he was also having affairs, leading to the breakdown of his marriage. In the documentary Wendy, who was using heroin as well as raising their daughter Arkie, speaks frankly of the turmoil of this period and the distress addiction caused in their lives and how, eventually, she was able to kick the habit. Brett, however, fell victim to the drug, overdosing in a motel room in Thirroul on the south coast of NSW in 1992. In Whiteley Bogle has successfully presented a wonderful homage to, and portrait of, Brett Whiteley the man and the artist. In collaboration with Wendy, the director has unearthed a mass of previously unseen footage, home movies and other fresh material which give the viewer a comprehensive view of the artist’s life. The images include original interviews with Whiteley himself, augmented by the voice of Alan Dukes reading from notebooks and other written sources. Dramatic recreations using look-alike actors are used to good effect too, plus interviews with some of the artist’s friends and contemporaries. All of these components paint a picture of the inner life of their subject that is quite remarkable; if he hadn’t chosen paint as his medium, Whiteley could’ve been a writer or a poet, such was the originality of his voice and vision. This documentary is an impressive portrayal of one of Australia’s greatest artists - it takes its audience on a journey through both the good and bad times of a complex life that was unique and is now, thankfully, preserved for posterity.